In order to effectively treat a rash, it’s always good to know where it came from. How Do You Get a Rash? Lots of foods cause inflammation, such as dairy, nuts, and processed foods. However, my sister was prescribed the macrolide antibiotic drug clarithromycin from her doctor for a throat infection. It is also used to treat other bacterial infections, such as bronchitis, sinus infections, ear infections, pneumonia, and skin infections. I looked up the side effects of clarithromycin. It turns out that the same drug that can help clear the skin also helped cause her skin rash. But in most cases, internal issues cause rashes or other skin conditions. There are some inflammatory foods I told her to cut out of her diet right away (too bad they were some of her favorites): meat, processed foods, baked foods, wheat products, gluten grains, ice cream, and anything else with dairy. Cutting out these foods definitely doesn’t help relieve her rash, but the root cause of her problem also could have been created from unknown food allergies or sensitivities, excessive stress (she has two jobs), candida, and weak digestion. Skin conditions can also be caused by gut dysbiosis, which is an imbalance of the good and bad bacteria in your gut. I highly recommend attempting to find out if your skin rash is related to any of these internal issues that can lead to consistent rashes and other troublesome health problems. Having said that, my sister also wanted relief from her skin rash right away. Here are the three things I told her to use for rash relief that she had around her house. Extra-virgin olive oil is not just great for salad dressings; it also helps soothe your skin and reduce itching. It contains the healthy monounsaturated fat oleic acid, vitamin E, and other potent antioxidants that benefit skin’s health. Extra-virgin olive oil has an incredible protective effect on cells, which can lower your risk of inflammation and cellular damage. My sister rubbed some extra-virgin olive oil on the affected area three times daily. Before she knew it, the rash was gone. As an alternative, turmeric powder also combines well with olive oil for natural skin rash relief. Aloe vera is considered a very important plant within Ayurvedic medicine, and it has been used for thousands of years in many cultures. It contains emollient, anti-inflammatory, antifungal, and antibacterial properties that can help relieve skin rashes and symptoms, such as contact dermatitis, redness, and itchiness. It is also known to relieve other skin conditions, such as insect bites, sunburns, and minor burns or cuts. 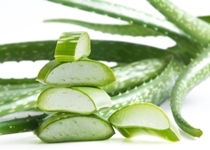 It is best to extract fresh aloe vera gel from the aloe leaf and apply it to the rash. After 20 minutes, rinse the aloe vera off. For best results, repeat three times daily until the skin is clear. I would avoid the packaged aloe vera gels, as many contain added chemicals that may cause further irritation. Another skin rash remedy that I also keep handy for salad dressings is apple cider vinegar. It helps reduce inflammation on the skin. Apple cider vinegar is great for any type of irritation or rash caused by fungus or bacteria; however, it is acidic, so you should dilute it with water before you put it on your skin. To apply it, simply place a cotton ball dipped in apple cider vinegar on your skin rash and leave it there for a few minutes. Do this several times daily. After a few days, the rash should be gone. Omega-3 essential fatty acids are always key for healthy skin; fish oil, seal oil, and ground flaxseeds are beneficial sources. Vitamin E is also a powerful antioxidant that can produce healthy skin; consider using a high-potency multivitamin and mineral. An added bonus: these formulas contain other important nutrients for skin health, such as vitamin A, zinc, and selenium. A high-end probiotic supplement can also help replenish the gut with good bacteria, which also benefits digestion. Herbal remedies and essential oils can also benefit the skin. “Apo-Clarithromycin – Uses, Side Effects, Interactions – Drug Factsheets,” C-Health web site; http://chealth.canoe.ca/drug_info_details.asp?channel_id=0&brand_name_id=4663&page_no=2#AdverseEffects, last accessed January 28, 2015. “Home Remedies for Rashes,” Top 10 Home Remedies web site; http://www.top10homeremedies.com/home-remedies/home-remedies-rashes.html, last accessed January 28, 2014. Foster, M., et al., “Evaluation of the Nutritional and Metabolic Effects of Aloe vera,” Herbal Medicine: Biomolecular and Clinical Aspects and Clinical Aspects: 2nd Edition (Boca Raton (FL): CRC Press, 2011), chapter 3. Lawless, J., The Encyclopedia of Essential Oils: The Complete Guide to the Use of Aromatic Oils in Aromatherapy, Herbalism, Health & Well-Being (San Francisco: HarperCollins Publishers Ltd., 2013), 200.